Iranian President Mahmoud Ahmadinejad has suffered a fresh blow after his nominee for oil minister withdrew in the face of criticism from MPs. Sadeq Mahsuli was the second candidate to be chosen by the president, but his lack of experience caused opposition. The government has been without an oil minister for three months after the Majlis, or parliament refused to accept the first of Mr Ahmadinejad's nominees. 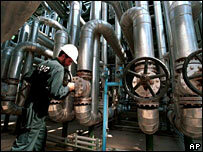 Iran is the world's fourth biggest producer of crude oil. Mr Mahsuli had previously served as governor of Orumiyeh province and as a deputy defence minister. He was also an adviser to the Expediency Council. Speaking in parliament after Mr Mahsuli's withdrawal, Mr Ahmadinejad said no government since the Islamic revolution in 1979 had been attacked so viciously as his. A group of Majlis deputies had written to President Ahmadinejad and requested he replace Mr Mahsuli with someone with more experience, the state news agency Irna reported. The MPs added that this would avoid the embarrassing situation of the Majlis vetoing his choice for a second time, and ensure better relations between government and parliament. Several deputies from the oil-rich southern province of Khuzestan, where most of Iran's oilfields are located, also said they opposed the nomination. The president's nomination came under fire in an open session of the Majlis on Tuesday. "How can [such] a person... implement the justice the president wants," said Emad Afrouq, a conservative deputy. "Mr Mahsuli is not fit for the oil ministry or to even to be a member of the cabinet," added Gholamreza Mesbahi Moqaddam. The BBC's Frances Harrison in Tehran says the crisis indicates a growing rift between the hardline Majlis and the president, even though both are considered to share a similar ideology. Would US attack or live with nuclear-armed Tehran? More sanctions after new defiance?